The glycemic index is a measurement scale from 1 to 100 that rates foods based on how they affect blood sugar. High-glycemic foods, which are 70 and higher on the scale, spike your blood sugar the fastest. Medium-glycemic foods range from 56 to 69, and low-glycemic foods are 55 and under. The key to making desserts with a low glycemic index is to include as many whole food ingredients as possible, like fruits and vegetables, nuts and seeds, dairy products and whole grains. Fruit is sweet, but it's also healthy and, with the exception of melons and pineapples, it's low-GI. For example, blueberries are 53 on the glycemic index, and strawberries are only 40. For dessert, you could have some fresh fruit with a dollop of unsweetened whipped cream or unsweetened Greek yogurt, since dairy is low-GI. Even sweetened yogurt with fruit is only 33 on the glycemic index. You could even make a milk shake by blending milk and frozen fruit instead of sugar. Create your own low-GI baked dessert by replacing white flour with whole-wheat flour and sugar with an artificial sweetener. Artificial sweeteners, including acesulfame potassium, aspartame, saccharin, sucralose and neotame, are sugar-free, so they don't even show up on the glycemic index. A muffin made from wheat flour is only 46 on the glycemic index. Oat bran also has a low GI score, so you could also use that instead of whole-wheat flour. Instead of adding something like chocolate chips to the mix, use dried fruit to keep a baked dessert low-GI. Nuts contain few carbohydrates, and thus have a low GI. Try baking some banana-walnut muffins using whole-wheat flour and a sugar substitute. Because oatmeal has a GI of 49, you could bake low-GI oatmeal cookies with a sugar substitute and include raisins and pecans. Make dessert bars with oats, peanuts, a sugar substitute and a little bit of chocolate drizzled on top. Make some simple apple rings by putting a sliced, cored apple in the oven at 300 degrees Fahrenheit, sprinkled with some lemon juice and cinnamon. Instant chocolate pudding made with whole milk is 47 on the GI scale, so technically it's a low-GI food. 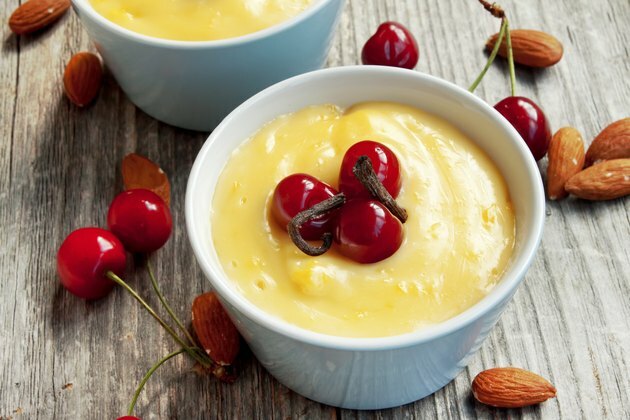 You can also make a healthier low-GI pudding using whole food ingredients. Chia seeds are too low in carbs to show up on the glycemic index. They form a gel when combined with liquid and can be used in combination with milk as a base for puddings. Instead of adding sugar, add pureed peaches or any other fruit you'd like to puree, and sprinkle in an artificial sweetener if needed, to make a low-GI pudding.